After a successful show in Vancouver, the GreenRush Conference is coming to Toronto this week (on June 26th). The recent spotlight on medical marijuana in Canada has revealed interest from a wide array of stakeholders including investors, existing (and possible) producers, regulatory bodies, commentators as well as from consumers and advocacy groups. Organized by Next Gen Metals Inc (CSE:N), the upcoming conference will be a full-day session featuring over 20 speakers and more than 30 exhibitors. GreenRush Toronto, therefore, may be an ideal opportunity to learn more about the many sides of the Canadian medical marijuana conversation. The CSE (as well as several CSE-listed companies) will be among those exhibiting and speaking at the conference. We will also be hosting a corporate presentation for individuals and firms interested in learning more about listing on the CSE. For those interested in learning more about (or registering for) the GreenRush Conference, click here. To see our gallery from the first GreenRush conference in Vancouver, click here. We look forward to seeing you there! If you’re a Canadian investor, the chances are good that you’ve heard or seen a massive spike in interest in medical marijuana. From pundits to producers and all points in between, interest in the Canadian medical marijuana space has reached frenzied levels, driven there by the new Marihuana for Medical Purposes Regulations (MMPR) announced by Health Canada. Recent reports peg the number of companies that have applied for licenses from Health Canada to grow and distribute medical grade marijuana at almost 850 with more coming in daily. And while there may only be 13 producers that are licensed to sell or provide medical marihuana under the MMPR today, that number is almost surely expected to rise as those applications work their way through the approval process. With regulatory, administrative and legal hurdles to the MMPR still remaining, speculators and investors are betting that the entrepreneurs behind many of these firms find a way to stand out and succeed. Two such entrepreneurial medical marijuana focused companies: Supreme Pharmaceuticals (CSE:SL) and Cannabis Technologies (CSE:CAN) were recently profiled in a pair of pieces by Proactive Investors. From the piece on Supreme Pharmaceuticals, scale appears to be their strategy of choice. With formal final approval under the MMPR still pending, Supreme Pharmaceuticals is nonetheless continuing to work towards its goals of becoming a premier high volume producer in the near term. 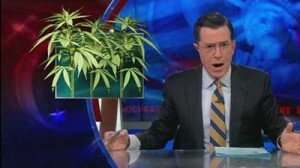 On a slightly different note, technology appears to be the strategy employed by Cannabis Technologies. With a view towards finding innovative ways to deploy and deliver medicinal cannabis, Cannabis Technologies has its eye on adopting a pharmaceutical company-like model. With much of the Canadian medical marijuana industry still in flux, it remains to be seen how the marketplace will react to the sheer number of names and providers focused on the space. On the Canadian Securities Exchange, there are a number of companies in addition to Supreme Pharmaceuticals and Cannabis Technologies that are active in the medical marijuana space. One thing that does remain clear, however, is that interest from speculative capital is still providing attention and dollars to the medical marijuana story. The waters for securities intermediaries in Canada seem like they’re about to get a bit choppy. Recently, Canadian Securities Administrators announced that some of rules that govern the transaction of securities are up for review. Specifically, amendments are being proposed to the National Instrument 23-101 (NI 23-101) Trading Rules in the areas of trading fees, data fees and most notably, the order protection rule (OPR). Given the stakes involved, the proposed changes are almost certain to generate a spirited debate between those in favour of and those opposed to the amendments to the OPR. One such point of view came from Jeffrey MacIntosh via the Financial Post. In his recent article, MacIntosh takes aim at the proposed NI 23-101 Trading Rules amendments and provides an insightful analysis about the potential impact they may have on the multi-marketplace model. While there are other issues as well, OPR appears to be a linchpin, and will therefore be an important topic to continue tracking. If you have thoughts or comments on the proposed amendments to NI 23-101, we’d also love to hear them – feel free to leave a comment below. 2014 continues to be a year of great accomplishments for the Exchange for Entrepreneurs. Earlier this month, the Canadian Securities Exchange (CSE) celebrated the achievement of another key milestone by being named to the OTC Markets Group list of qualified foreign stock exchanges, and in doing so, has opened the door to even greater attention and interest from one of the most popular marketplaces in the US. Specifically, as a result of this designation, CSE-listed companies are now eligible to apply for trading on the OTCQX and the OTCQB marketplaces. Given the scale and popularity of the OTC marketplaces, the news is certainly creating a buzz among investors and issuers in Canada and the US. The approval announcement came just a few days ahead of a visit to Canada by the president and CEO of the OTC Markets Group, Cromwell Coulson. As part of a campaign to raise awareness about the exchange, Coulson strategically selected Vancouver as the location to talk to industry and media because of the significant concentration of venture-stage companies. Like any savvy investor, however, the timing of Coulson’s visit was just right. With the passage of the Jumpstart Our Business Startups (JOBS) Act in the US, there have been a number of important barriers lifted for “emerging growth” companies to be able to attract early investors. With restrictions on advertising to certain investors lifted and compelling amounts for capital raising allowed under the JOBS exemptions, there may very well be a catalyst for more active deal making to occur especially for junior and venture stage companies. Given the pace of change that is occurring, however, only companies that can keep up with these changes can truly take advantage of them. One way in which companies can move with greater agility, is in the meeting the regulatory disclosure requirements. The streamlined continuous disclosure model, recognized by the OTC marketplaces as viable reporting structure, will give CSE listed issuers the opportunity to respond more quickly to emerging funding landscape. As advocates for reducing complexity, the CSE believes growing companies should be able to focus on growing their businesses and ultimately be more agile in the way in which they run themselves. The acceptance onto the OTC Market’s list of qualified foreign stock exchanges is a great milestone in a year that has already seen so much positive news and interest in the CSE. Given the alignment of the CSE’s streamlined approach to cost and complexity, it appears that this could provide emerging growth companies with a strategic edge they need to compete in a quickly changing landscape. For many in the securities industry, complexity is the new norm. Whether because of technology infrastructure, regulatory compliance or simply keeping pace with innovation, there’s simply just more to manage – everywhere. And, wherever complexity seems to appear, cost seems to show up like a faithful wing-man. It seems reasonable, therefore, that one promising strategy to lower costs would be to decrease complexity – especially at the trade execution level. At the Canadian Securities Exchange, it is precisely the idea of making the current Canadian securities landscape more efficient that underpins their latest move to simplify access for a key stakeholder in the market ecosystem: the dealer community. As announced in an earlier news release, the CSE is taking a bold step to simplify pricing and access for the dealer community by eliminating the ‘maker/taker’ model and, in its place, implementing equal pricing for both active and passive sides of the trade. The table below summarizes the new trade execution fee structure as it applies to three tiers of securities trading price. Under this fee structure, both active and passive fees are priced at the same rate on each tier. This announcement is a win for the dealer community and for the trading public for two important reasons. First, with better pricing comes improved participation and better functioning marketplaces. Second, by eliminating the maker/taker price distinction, the playing field has been leveled for liquidity provider and liquidity consumer. As the exchange for entrepreneurs, we are committed to bringing innovative solutions to market operations. We understand that by simplifying the moving parts of the market, we’ve not only lowered industry costs but we’ve enabled wider participation and access to trading of junior public companies. The message of “simpler is better” is gaining traction with many junior public companies. The number of listed issuers on the CSE is up substantially through the first quarter of 2014 and trading volumes are also at historical highs. While there are still many hurdles to clear, a streamlined and more cost effective framework for dealers is an important step towards making simple the new normal. The March 31st deadline to apply for OSC participation fee relief is just around the corner. As a reminder, earlier this year OSC Staff Notice 13-704 mentioned that certain reporting issuers (class 1 and 3C) and smaller registered companies may be eligible for OSC participation fee relief. According to the OSC, this initiative was developed as a response to the challenging conditions faced by market participants, specifically those who experienced significant decreases in market capitalization (for reporting issuers) and revenues (for registered companies). For reporting issuers, the fee relief may range from $160 to $13,350 and for registered firms, the range is projected to be between $235 and $17,725. The notice states that most firms will end up qualifying at the lower end of the range. To help ensure the application process goes smoothly, it is recommended that supporting documentation be provided on how previous fiscal market cap has been calculated. The full details on eligibility, documentation and support can be found by clicking on the following link. There is no cost to apply. This year’s PDAC was a great opportunity to connect with the mining & exploration industry, government, investors and more. For the Canadian Securities Exchange it was particularly eventful because in addition to having a very busy booth at the Investor’s Exchange, our team was also involved in keynote addresses, panels, networking events (including the parties!) and interviews. The PDAC has continued to be the conference where mining and exploration companies and investors (big and small) converge to talk about the state of the industry, raise capital and talk about what’s coming next. With so much going on, there’s no shortage of things to reflect on, however here is a sample of what we got up to at the convention and our thoughts on what the remainder of 2014 holds for the industry. Our booth was a hub of activity over the course of the conference. Representatives from the CSE team were available at the booth to answer questions about the many exciting developments underway and for those who simply wanted to learn more about us. We were also joined by some of our listed issuers at the booth including Augustine Ventures (WAW), Copper Reef Mining (CZC), Newlox Gold (LUX), Tartisan Resources (TTC), Excalibur Resources (XBR) and BacTech Environmental (BAC). Click here for a full gallery of images from the show floor. 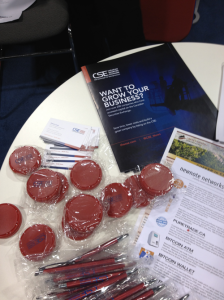 Our conference swag also brought in curious passers by who were interested in getting their “shine on” with our CSE-branded screen wipes and shoe shiners. One of the first big events was the sold-out mining outlook luncheon. Deputy Chairman of the CSE, Ned Goodman, was the keynote speaker at this session and he provided the audience with an entertaining and thoughtful perspective of the current state of the global economy with a particular focus on currency and gold. We’ve pulled together an interesting selection of tweets from folks in the audience at the presentation. CSE’s CEO Richard Carleton participated in the panel discussion on the role that stock exchanges can play in assisting mining (and in particular junior mining) and exploration companies in navigating the current capital raising crisis. Joining Richard on the panel was Eddie Grieve of the Australian Stock Exchange, Francis Stenning of Bolsa de Valores de Lima, Peru and John McCoach of the TSX Venture Exchange. At this event Richard outlined some important points about what exchanges can do and what other stakeholder partners can do in order to help companies adapt to the new market realities. On the exchange side, the CSE is lowering the cash and operational burden for companies to maintain a public listing and making it easier for trading desks to access market data. Examples of the impact of disclosure policy on companies was also highlighted. The Australian Stock Exchange was shown as an example of an exchange that confronted the issue of regulatory burden and the success and challenges it experienced as a result. One very interesting point that came up was the idea of regulatory-driven restrictions on the kinds of investments that could be recommended to individuals based on their age. Richard Carleton aptly framed what he found troublesome about this when he pointed out that by restricting the age that certain products could be recommended to individuals, people such as Ned Goodman would be steered away from investing in equities. 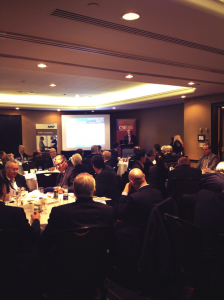 A packed house attended the networking lunch co-sponsored by the CSE, MNP LLP and Chitiz Pathak LLP. Attendees were treated to lunch as well as some food for thought as several CSE-listed companies presented a brief snapshot of their company story. A hats off goes to CSE Senior VP Robert Cook for being able to keep everyone on course during the presentations. CEO Richard Carleton also provided some brief highlights on the recent performance of the exchange and on the exciting forthcoming developments at the CSE – including further progress with getting more online brokerages to provide online trading and real-time data to their clients. After the networking lunch, the CSE provided a quick overview of what was involved in transitioning to listing on the CSE, including details on timing and the steps required. For more information on the process, click here. Click here for a full gallery from the event. For those who know Ned Goodman, he is not one to beat around the bush. 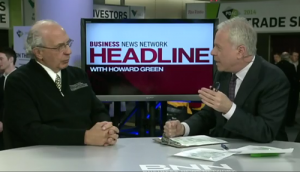 The electric interview between him and Howard Green of BNN’s Headline was a great snapshot of Ned’s views on gold and on what it takes to successfully run and manage mining companies. Click the following link to access this interview. 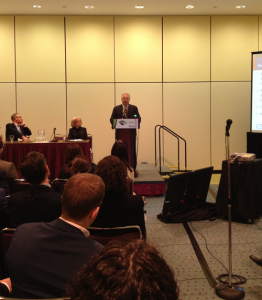 The PDAC, especially this year, exemplified the resilient spirit of the mining industry. When faced with adversity, the industry is working creatively to adapt to the current market and the CSE, with its advocacy efforts and solutions for industry partners, is proud to be a part of that solution. With the number of deals, announcements and meetings that took place at the PDAC, 2014 looks to be an exciting year ahead for the industry and most certainly for the CSE and our partners. We’re grateful for the connections we have made and look forward to building off the positive momentum from PDAC.